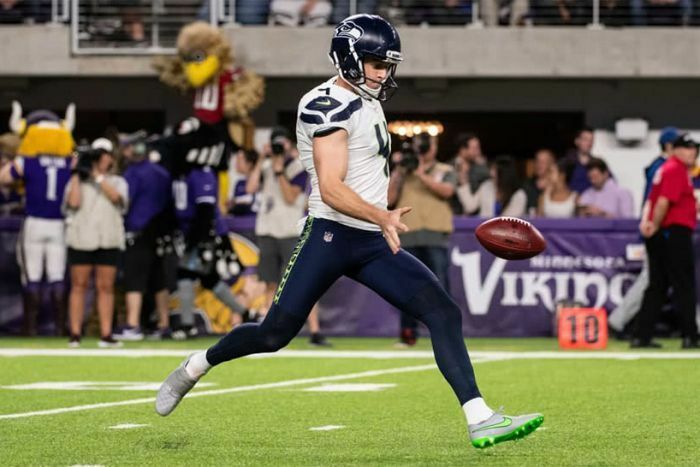 Sydney-born punter Michael Dickson has capped a stellar rookie year in gridiron football with a spot in the NFL All-Pro team. The Australian was named in special teams for the All-Pro team, voted by American NFL journalists, alongside the likes of Kansas City quarterback Patrick Mahomes and LA Rams defensive tackle Aaron Donald. Scooped up by the Seahawks at pick number 149 in the NFL Draft, Dickson has since established himself as a punter with X-factor, bringing a distinctive style to the ordinarily functional position. Dickson sent commentators into joyous fits when he pulled out a drop-kick kick-off against the Chicago Bears, with ESPN callers Joe Tessitore and Jason Witten left scratching their heads over when the last time such a kick was pulled off. Seahawks coach Pete Carroll is known for using non-traditional methods, which has clearly benefited Dickson after he pulled off the drop-kick stunt again, this time in December. But even with the booming boot and the rugby-style drop kicks, they pale in comparison to the game-clinching trick he pulled off against the Detroit Lions. Leading 28-14 with two minutes left to play and pinned dangerously close to their own end zone, the Seahawks called on their punting unit to relieve the pressure. But instead of catching the ball, soaking up a bit of time and then stepping out for a safety — a traditional set piece used by teams under the cosh to eat into the clock — Dickson did the inexplicable. He received the ball deep in his end zone as if to kick, only to shimmy to his right before spotting a path opening up before him, before running nine yards to achieve a first down. The bold play prompted raucous celebrations among fans and Seattle the coaching team alike. Dickson also became the first rookie punter in more than three decades to be selected to play in the Pro Bowl, an all-star game with players voted on by fans.